New Zealand scientists have teamed up with local fishing companies to bring forth a revolutionary concept in commercial fishing. The technology improves the current system by sorting out fish before hauling them on-board the fishing vessel and keeping the catch fresh for the consumer. Known as Precision Seafood Harvesting (PSH), the innovative process is the result of 10 years of research done in New Zealand with a combined investment of $26 million by fishing companies Aotearoa Fisheries, Sanford, and Sealord, and an equal amount granted by the Kiwi government. PSH replaces conventional trawler nets with a large flexible PVC liner that is used to segregate the correct species and size of the catch. Juvenile fish can easily swim back to the water through “escape portals” and non-target species, known as by-catch, can also be thrown back, aiding conservation efforts. 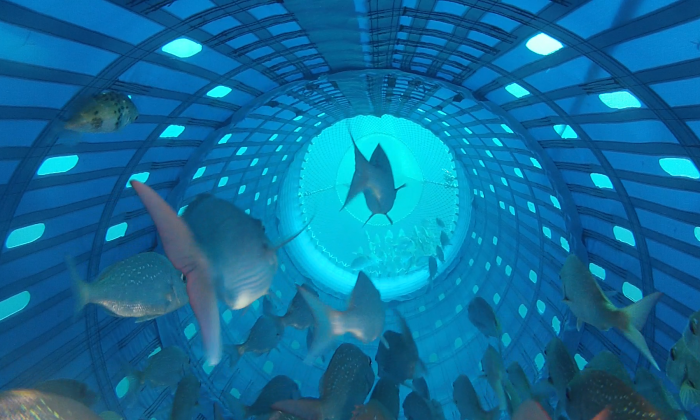 While back on the vessel, the liner is not drained off water and the fish still swim around comfortably, translating to a better catch for the companies and higher value for the consumer. Regarding the current situation of commercial fishing and the investment, Trish Sherson from Sherson Willis Ltd. told the Epoch Times, “Current fishing methods have been around for 150 years. The commercial partners in Precision Seafood Harvesting, Sealord, Sanford and Aotearoa Fisheries have held a long-term desire to further improve the performance of their fishing effort, in terms of both quality and environmental outcomes. Regarding the impact of the initiative, Sherson said that the initial focus “is to commercialize new technology for the New Zealand fishing industry. Over the next 4.5 years of the PSH program, the technology will be further developed, refined and tested across the full range of vessels in the commercial fleet. Alistair Jerrett from Plant and Food Research, one of the key players in PSH, said in a press release earlier this month that the “aha movement” came when they reflected on the condition of the fish: “Why do we have to strain these fish out, why do we have to exhaust them, why do we have to damage them during harvest—the new system changes all that. “One of the objectives is to make sure that any animal that reaches the surface, if we can’t select it out underwater, is delivered back to the sea unharmed.” This is applicable for all larger species including rays and sharks. They are released back in the deep waters itself and not disturbed by bringing to the surface.